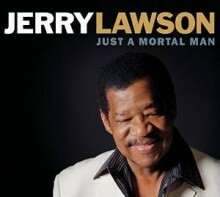 Not many musicians make their solo debuts at the age of 71, but Jerry Lawson is no ordinary artist. The former lead singer of the legendary vocal harmony group The Persuasions, Lawson has been performing for over 40 years and recorded 22 albums with the group. But singing a cappella all of those years left Lawson with a burning desire to perform and record with lush instrumentations, and to choose his own songs “with lyrics that really matter to me.” His wish has been realized with Just a Mortal Man, the title likely a comment on his near death experience prior to the album’s completion. Working closely with singer-songwriter Eric Brace, who produced the album, they assembled some of Nashville’s finest musicians including Brace on acoustic and baritone guitar, Joe Pisapia on electric guitar and pedal steel, Jen Gunderman on keyboards and accordion, Duane Blevins on drums and percussion, and the McCrary Sisters on backing vocals. Lawson opens with Paul Simon’s ethereal “Peace Like a River,” closely following the original arrangement until the chorus, which becomes the deeply personal spoken proclamation, “You can beat us with wires, You can beat us with chains / You can run out your rules, But you know you can’t dream the history train.” Two of the tracks were selected as tributes to Lawson’s favorite singers: the Temptations’ David Ruffin and the late blues singer Bobby “Blue” Bland. Lawson retains the ‘70s vibe and orchestration on the title track “I’m Just a Mortal Man” (from Ruffin’s 1973 solo album), while Bland’s “Members Only,” about “a party for the broken hearted,” is a bit smoother around the edges with the McCrary Sisters taking over the chorus. Featuring a mix of classic and contemporary songs, Just a Mortal Man has broad appeal, effortlessly crossing genres but with a definite Nashville sound. The album is a fine showcase for Lawson’s vocal abilities, which after 40 years are still above and beyond the range of most mortal men. This entry was posted in Folk and Country by aaamc. Bookmark the permalink.